Hard alloy is a kind of alloy material used commonly, its most important feature is high hardness and abrasive resistance. From the composition, it is a kind of alloy material made of refractory metal (tungsten carbide, titanium carbide, etc.) and bonded metal (like cobalt, nickel, etc.) through powder metallurgy. Hard alloy material CNC machining are usually used for cutting tools, cold working dies and high abrasive resistant parts. Some of our customers asked about this materials, and now Creatingway also pay attention to increase our material service filed. What are the characteristics of hard alloy material CNC machining? Hard alloy has high hardness andabrasiveresistance. Under normal temperature, its hardness can reach 69 to 81HRC. Therefore, the cutting speed of this material can be 4 to 7 times faster than that of high speed steel, and service life is five to 80 times longer than a high speed steel cutter. We have to slowly whole machining process, and order speical tools for hand alloy material cnc machining. Hard alloy also has high strength and elastic modulus. Its compressive strength reaches 6000MPa, and the elastic modulus can reach up to 735MP. Both of these indexes are higher than high-speed steel. However, the flexural strength of hard alloy is low, only 1000 to 3000MPa. Hard alloy has good corrosion resistance, oxidation resistance and high temperature resistance. It is usually good to resist the corrosion of the atmosphere, acids and bases, which is not easy to oxidize, and can be hardened at a temperature of 900 to 1000 degrees. As usual, we will have twice or more machining process to completete, Fristly we need to rough cnc machining material, then have material heat hardness process, then machining again to make whole precision to meet requirement. The linear expansion coefficient of hard alloy is very small. It can have stable shape dimension when processing, So most of time, we will make 2-3 times to complete our parts, make whole parts with Dynamic straining aging process etc different process to make parts percision. Usually parts made by hard alloy can no longer be processed and re-ground. This is because the high brittleness of hard alloy, it’s easy to cause fragmentation when re-grind, so can only use electric processing such as electric spark, wire cut, electrolytic grinding or special grinding wheel. 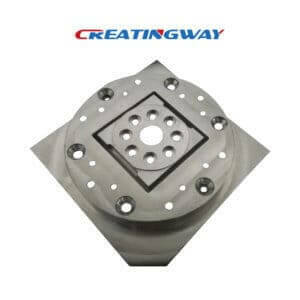 Creatingway serves various material for different customers’ request and will still keep update new materials. If material of your project can’t be done, contact us, maybe we can be a help to offer different solution.